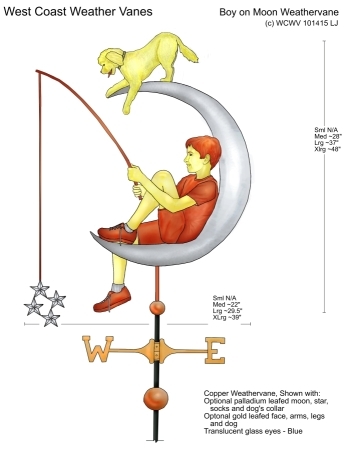 Our Boy on Moon Weathervane was commissioned by a local family who wanted to capture the magic of childhood in a portrait sculpture of their son and his beloved Goldendoodle. They visited us here at our studio and we talked about the project, took photographs of their son and his little buddy, Cooper, and gave them a studio tour so they could see examples of our craftsmanship in the form of custom weathervanes currently underway in our workshop. 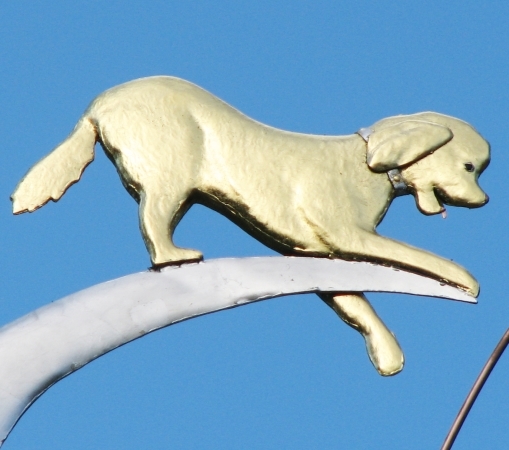 While it is always a treat to meet our actual customers in person, nothing but good photos and conversation is necessary for us to create a splendid portrait weathervane. We often create commissions for customers who live in different parts of the country or elsewhere around the world. In fact, working via phone and email is how most of our new commissions come together. 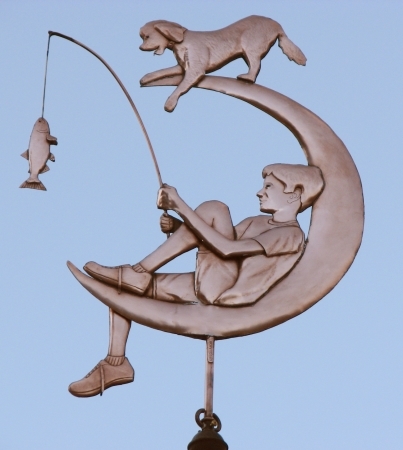 In our original design, we placed stars at the end of the boy’s fishing line (see our drawing for this weathervane), but switched to a fish instead to honor the boy’s special relationship with his grandfather. 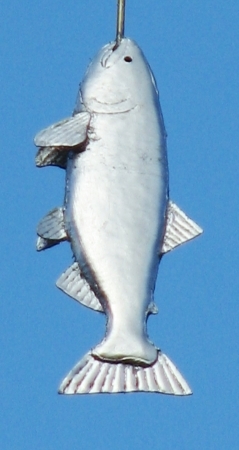 The two of them love to fish together at the nearby Monterey Bay. Meanwhile, Copper, the energetic Goldendoodle, playfully participates in the action. 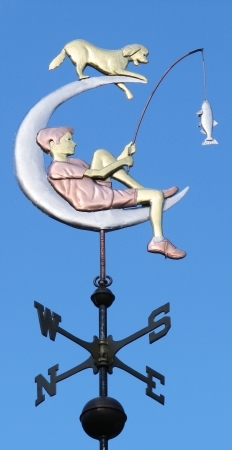 No detail is too small when creating a portrait weathervane, so the actual weathervane shows our young model with his characteristic untied shoe laces rather than neatly tied shoes in our original drawing. 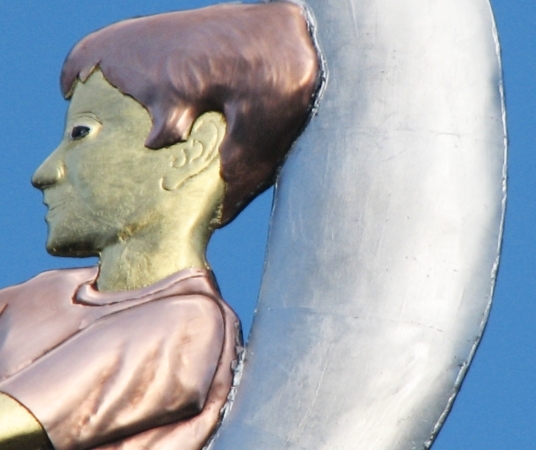 The sculpture piece was fabricated entirely of copper sheet in high detail swell bodied style. 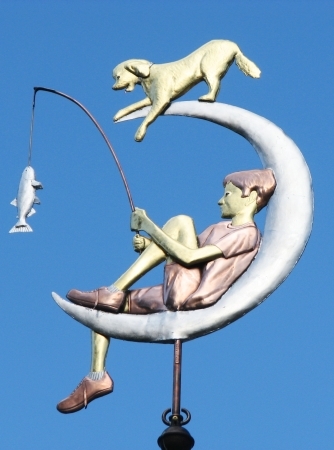 The boy, dog and salmon on the fishing line all have glass eyes. 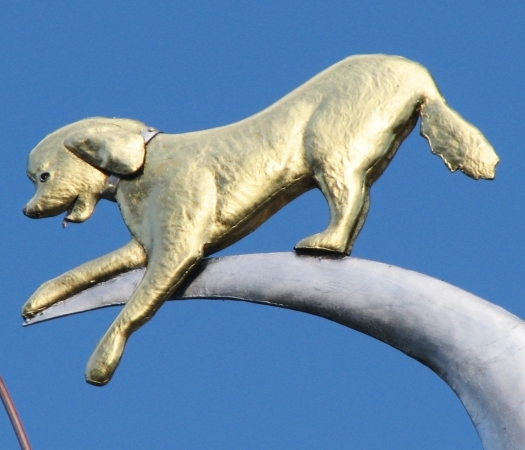 We wanted to create some bright contrast to the sculpture piece by the addition of optional gold gilding of the boy’s face, arms, legs and to match Cooper’s light colored coat. 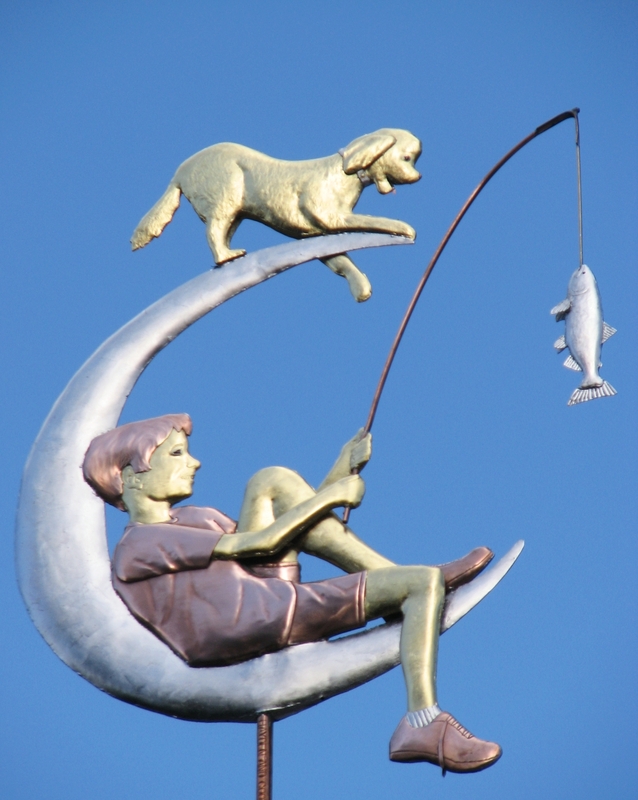 We also added palladium leaf to the moon, fish, and the dog’s collar for silvery sparkle. The final effect is truly lovely and this gilding will remain bright for many decades as the copper surface weathers and darkens to a deep chocolate brown before eventually turning a beautiful turquoise green. This piece also has four ‘lucky pennies’ including the traditional penny from the year of the weathervane’s creation, and three representing important dates in the family history.